Many commentators will make a huge deal about this, they will tell us this is the beginning of the end and we are due for a long bear market correction. They could be right – but is that likely? As Technical Analysts, our job is to be aware of behavioural biases and analyse the cold hard price, not to get swept up in emotion. History is our best guide on what we can expect, and the best thing we can do is follow it. 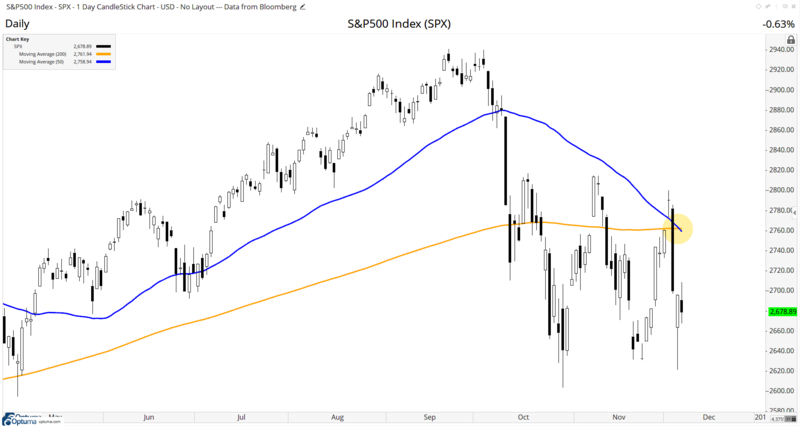 Let’s have a look at all the instances of this Death Cross in the S&P500 and see what we can find. 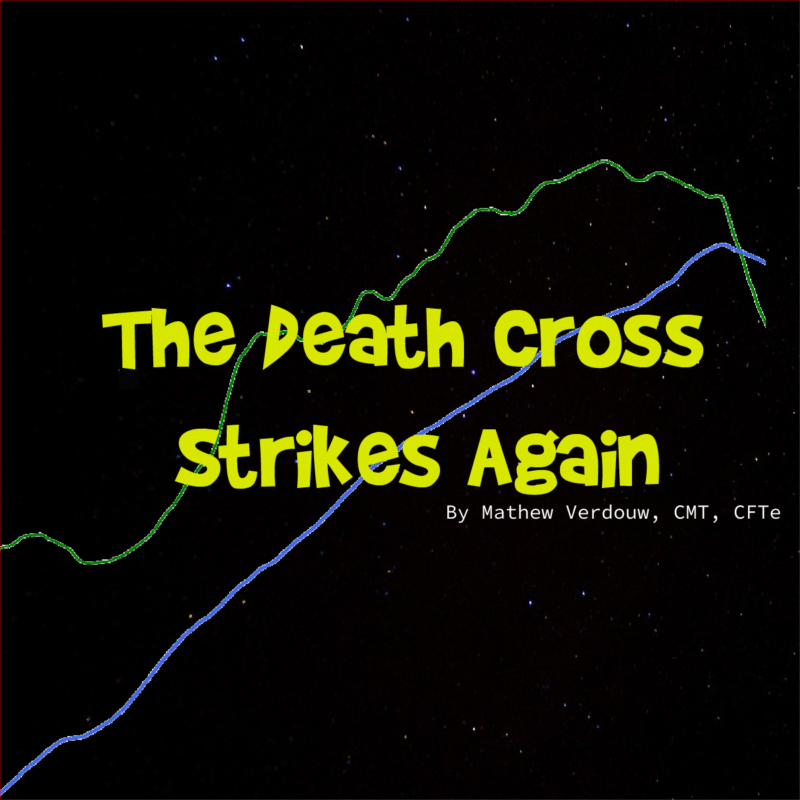 In total there have been 34 Death Crosses since 1954. 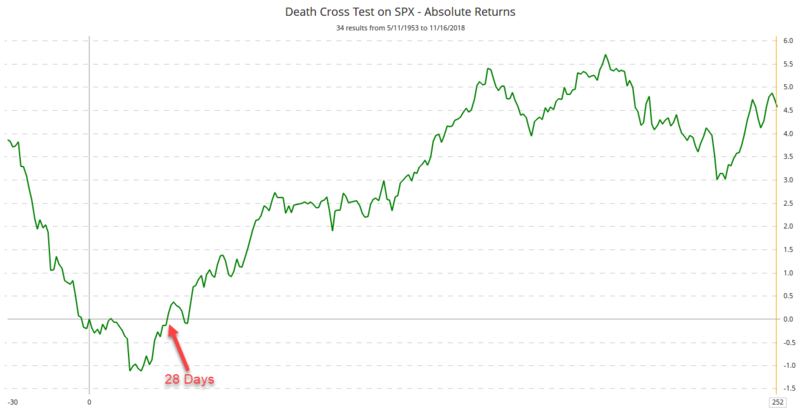 The chart below shows us the “average” mean behaviour of the SPX for 30 days leading into the death cross (on the left of the vertical 0 line) and 252 trading days after (essentially one year). Immediately we can see the average behaviour of the market—it recovers all it’s losses within 28 days and goes on to be around 4.5% higher by a year later. Perhaps a better way to view this is to look at all the signals in one chart. We can see that here. Now we can see the range of expectations from +30% to -40%. 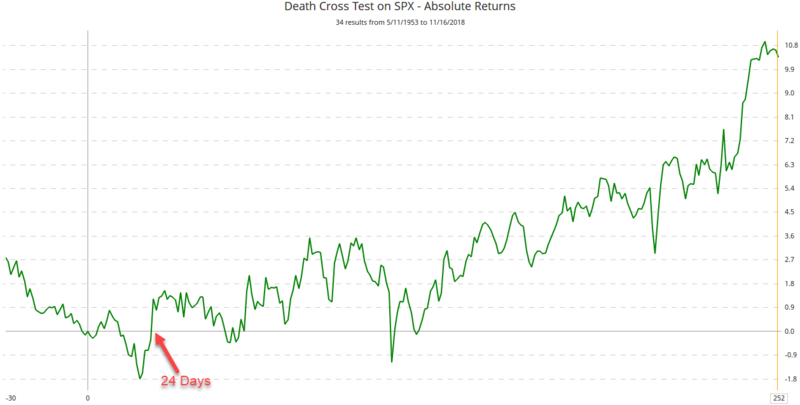 Note that the -40% (the green line at the bottom of the plot) was the death cross in December 2007. What this plot also shows me is that there were only 10 cases (29%) where the market had not recovered a year later. That means based on history we have a 70% probability the market will be higher than today in a year’s time. You can see the median struggled a bit more for the first 6-months but it finished over 10% higher at the end of the year. “Hang on” you may be thinking, “we’re at the end of a massive bull market, we are due for a bear market!”. My answer to that is “Why?”. The argument goes against what the greats of Technical Analysis – Dow and Gann – taught over 100 years ago. Namely, we are to trade with the trend. 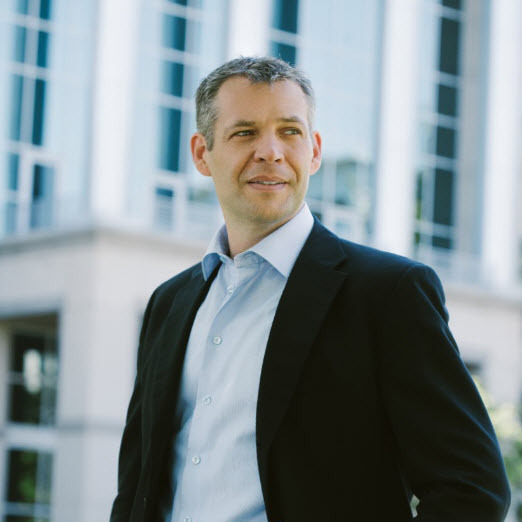 If the market is a long way up, then it’s going to take a big correction for us to consider that the primary trend has turned. Let’s take a look. 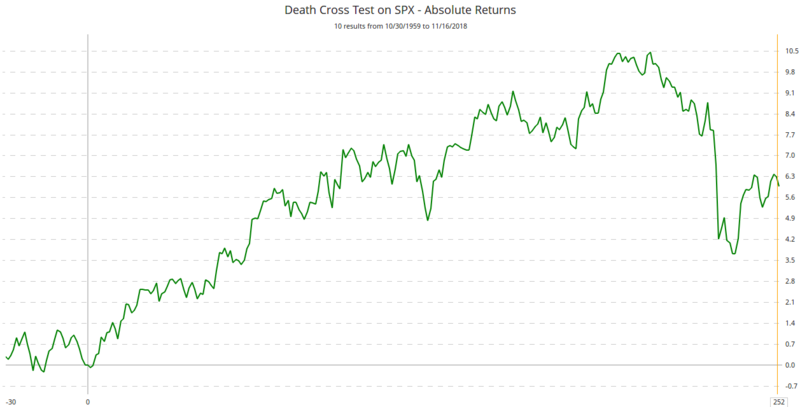 Here are the same results (Mean Returns) of the Death Cross, but this time we only take a signal if the market is up 10% on the previous year. 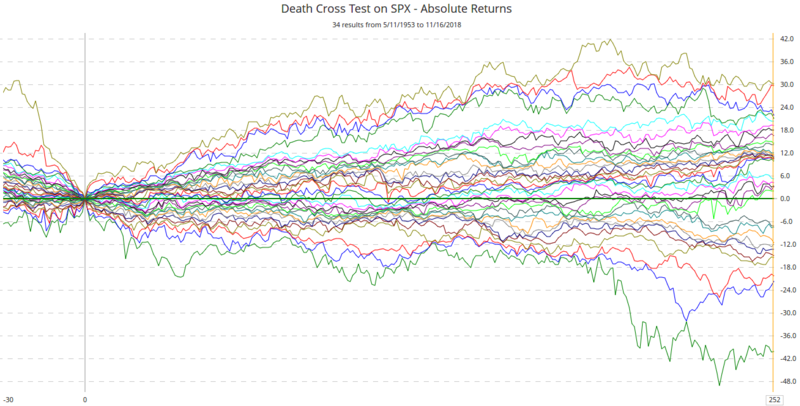 There are only 10 signals and they have higher returns than the group of 34. We can also see at the start of the plot that, on average, they recovered the losses within days. There were only three cases where the SPX was still down a year later, and they were all before 1981. So the point is that yes, we could be in for some short term pain, but there is not enough evidence to suggest this is the harbinger of the great bear. Great analysis. No emotions. Just the facts, just the trends, just the stats. They speak for themselves. ‘Price alone tells no lies.’ True technical analysis. Many thanks.